The Magic Cafe Forums - It's Contest Time! I know that quite a few story telling magicians don’t like to use switching wallets, but I can think of many situations in which a spooky looking wallet could have a great function in a story. However, I have noticed that most of the existing switching wallets look too fancy and modern to be used as an authentic prop during bizarre story telling magic. They are machine stitched, contain zippers and/or have a shiny (mostly black) leather look (disclaimer: of course, it’s likely that I’m not aware of all existing switching wallets. And there are beautiful leather cases, for example those made by Moonskin for Alchemy Moon, but they don’t ‘switch’ as far as I know). Furthermore, the wallets are often too small to contain the bigger Tarot cards. 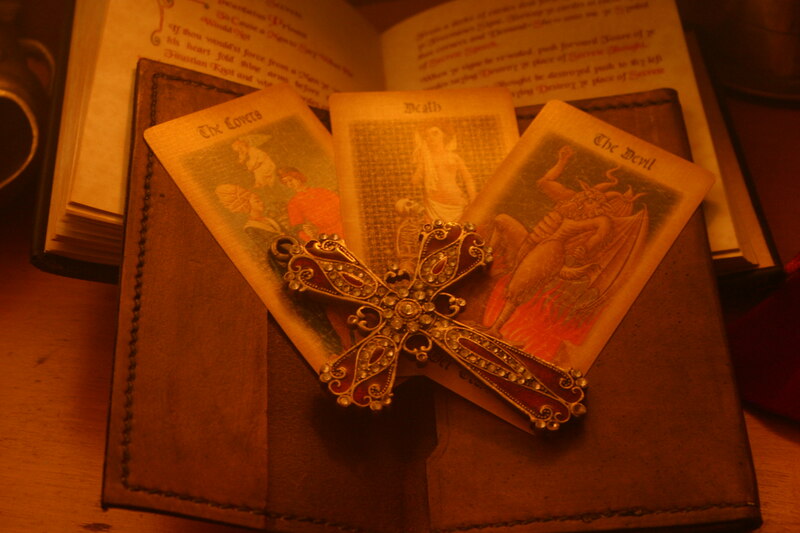 Therefore, I have decided to create the Bizarre Switching Wallet that can fit most Tarot cards. It is hand-made and hand-sewn in The Netherlands by a professional leathercrafts(wo)man. So no machines or child labor involved. The core of this new product is obviously the switching wallet. But I would love to offer a pdf with stories in which the wallet can be used. Therefore, I would like to start a CONTEST! The winner gets a ‘The Bizarre Switching Wallet’ for free. The stories of all contestants will be included in the accompanying pdf. David Eichler, one of the highly respected brothers in the bizarre has agreed to act as a contest judge, together with me. We welcome creative and innovative contributions and we hope you will have fun participating in this contest! To create a ’level playing field’, the stories need to make use of the wallet and three Tarot cards (which, by the way, will be included if you order the wallet): The Lovers, The Devil and Death. However, if you don’t like to be fenced in: feel free to come up with something else than the cards, but please use the wallet in your stories. The deadline is September 15, 2018. Ooo nice. I May have a go at this. I better sharpen my pencil. Awesome! Let me sharpen my pencil. "To Strive, to seek, to find, and not to yield!" Thank you very much for your responses. We're looking forward to your entries! Regards, Luc. By the way, the wallet works like a regular z-fold wallet. Please PM me if you have any questions. Luc. Any update on this contest, comments on submissions recieved? There are at least three stories for the pdf-booklet already (fourth will follow hopefully soon). We also know that several people are working on a story for the contest. There is still time for submissions to come in. You are wholeheartedly invited to participate! Regards, Luc. I have my submission ready to send but had a question. Do you have a timeframe for announcing the winner? Last contest left everyone hanging for almost 8 months. My submission has been humbly submitted. Thank you! Hey John, remember the contest which began last December and ended on Feb. 14th. The turnaround time to announcing the winner was less than a week. I stand corrected. For some reason I thought yours was before the other one. John, many thanks for your submission! Regards, Luc. Just to clarify... this is a story involving the wallet, not a bizarre routine, right? A work of fiction? Hi Seth, I'm not sure I fully understand your question. But I guess both options are valid. Regards, Luc. The people who have seen the wallet are very enthusiastic about it! The wallet looks great, smells great and above all: it does what it needs to do. We have now entered the last week of the story contest. Please share your story and you may get the wallet for free! All contestants will receive a set of the submitted stories. The stories will also be part of the pdf that will go with the wallet when it will be released in October, as mentioned.